The Silver Muse Silver Suite is like a luxury home away from home. It has a large living room and a separate bedroom, as well as a spa-style marble bathroom. The Silver Suite also boasts a spectacular double-sized veranda. This luxury cruise review explains what makes it so special. The Silver Muse Silver Suite is ideal for those who want more space and enhanced luxury amenities. This beautifully furnished one-bedroom apartment has a terrace-style veranda as well as an opulent bathroom. There is also original artwork on the walls, plus the services of a classically trained butler. Once you’ve checked in you might never want to leave! Indeed, when you stay in a Silver Muse Silver Suite it feels like you’re part of an exclusive club. There are just thirty-four Silver Suites and almost all are perfectly located on the top two decks of the ship, so they feel very private. Take a glimpse at the Owner’s Suite. Compare the Silver Muse Veranda Suite. Staying in a Silver Suite opens the door to a range of other benefits including a complimentary in-suite canapé service each evening, free laundry, free premium wifi and in addition you will often benefit from priority restaurant reservations too. Also, only the most experienced butlers are assigned to Silver Suites. The Silver Muse Silver Suite is extremely spacious. In fact each suite has 61 sq. m. / 657 sq. ft. of internal space. Plus there is a terrace-sized veranda measuring 12 sq. m. / 129 sq. ft. The Silver Muse Silver Suite floor plan. The Silver Muse Silver Suite floor plan will be familiar to those who have sailed in Silver Suites on other Silversea cruise ships. There is a gracious living room that leads on to a double-sized veranda. Behind the living room is the master bedroom as well as an enormous marble bathroom with separate toilet. I think the Silver Muse Silver Suite floor plan is clever and enhance the sense of space and easy living. The living room in the Silver Muse Silver Suite has genuine wow factor! In the first place it is huge, running the entire width of the suite. It is filled with light from floor-to-ceiling glass doors that lead on to the veranda. It has eye-catching designer touches and fine art hangs from the walls. In fact, the Silver Muse Silver Suite is the epitome of modern Italian elegance. The decor is tasteful in tones of teal and cream with dove-grey accents. The are chrome highlights and splashes of crimson in the scatter cushions as well. The space is clean and uncluttered. At one end there is a dining setting for four-people. At the other there’s a comfortable sofa as well as two designer, high-back armchairs. The living room also has a writing desk and study area as well as a mini-bar and in-suite Illy® Espresso machine. Interactive entertainment is just a click away thanks to a wall-mounted 55-inch flat-screen television. Plus, there is also a Bose Sound Touch 30 speaker system with Bluetooth connectivity. The bedroom in the Silver Suite is an oasis of calm in a sea of tranquility. Separated from the living room by a set of sliding doors it has either a king or twin-bed setup – the choice is yours. The luxurious bed linens are by Pratesi® of Italy and the mattress is one of the most comfortable at sea. There is also an extensive pillow menu which includes feather, hypoallergenic and even buck wheat stuffings. Consequently, you’re sure to have a perfect nights sleep. The bedroom in the Silver Suite has a king size bed. This heavenly bed is framed by a soft hand-crafted leather bedhead. On either side are night stands with generous storage spaces. There are also bedside lamps and multi-directional reading lights. On one side there is a clever bedside power unit which has US and European points and there is also a USB slot for charging mobile devices. The Silver Muse Silver Suite bedroom also has its own wall-mounted 55-inch flat-screen television as well as a small makeup table and vanity area. The veranda of the Silver Muse Silver Suite is so large it could almost be called a terrace! The 12 sq. m. / 129 sq. ft. space is extremely private and has room for a full compliment of stylish outdoor furniture. The Silver Suite veranda includes sun loungers and a dining table. This includes a dining table and chairs as well as two full-size sun loungers. In fact, your butler will ensure there are always beach towels ready for those sun loungers. During my voyage on Silver Muse the veranda was like a private haven with an ever changing ocean view. As a matter of fact it was the perfect place to relax with a good book, or to enjoy a glass of Champagne and some canapés as the sun sets. It is worth noting that the Silver Muse Silver Suite veranda is not teak, but rather a faux-teak surface. 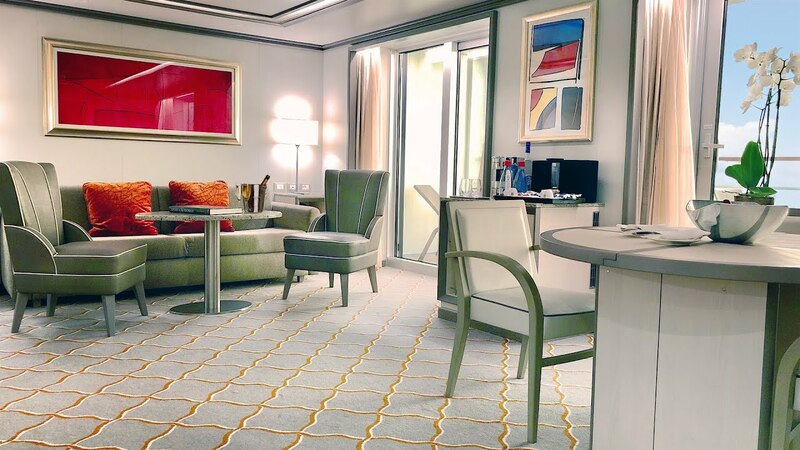 This is unusual for large suites on luxury cruise ships. However, teak has become very expensive. It is produced in only four countries; Myanmar, India, Laos and Thailand. In 2014 Myanmar – who supplied 75% of the World’s teak – introduced an export ban. This sent prices sky-high. So sadly teak verandas are becoming a luxury of the past. One word describes the bathroom in the Silver Muse Silver Suite – opulent. It is covered in Italian marble and there are splashes of gold as well as gleaming chrome fittings. The spa-style bathroom in the Silver Muse Silver Suite includes a Jacuzzi. The bathroom features a two-person Jacuzzi tub and a walk-in rainwater shower, complete with its own marble seat. There is also a generous double-basin vanity with ample storage space. In addition, a separate toilet with its own basin and vanity is located just off the bathroom. The walk-in rainwater shower even has a seat. There is a separate toilet in the Silver Suite bathroom. Silver Suite guests have a choice of bath products. There is Bvlgari as well as Ortigia, a delightfully fragranced range from Sicily. In addition there are hypoallergenic products available. Also Silver Suites come with Etro® bathrobes and Silversea slippers too. Ortigia bath products from Sicily. The Silver Muse Silver Suite has a huge amount of storage space. There is a very large walk-in closet with hanging space for about four cases full of clothing. There are also lots of drawers for delicate items as well as shelving too. An electronic safe has special compartments for jewellery and other valuables. There is plenty of storage space in the closet. Once you have unpacked there is plenty of room under the bed for storing cases, even the large hard shell variety. There are 34 luxurious Silver Suites onboard Silver Muse. Most are located in an exclusive enclave of their own on decks 10 and 11. Indeed, their position high above the water ensures spectacular ocean views. Silver Suite positions onboard Silver Muse. The Silver Suites are positioned midship as well as forward. So I recommend booking a suite close to midship if you are prone to sea sickness. Read the dining section of our Silver Muse review by clicking the button below.